Do I have to report my tutoring income on my taxes? Do I have to report my tutoring income on my taxes? Do I have to pay taxes on income from Wyzant? Short answer, yes, you probably should. Long answer follows below. If you work as a tutor for a company, they probably sent you a copy of a 1099. This is a form that companies fill out to announce to the IRS that they’ve paid someone over $600 as a contractor (i.e. not as an employee). If your company sent you a copy of a 1099, then you absolutely have to pay taxes on that tutoring income. The IRS knows you received it, and they will be expecting you to pay taxes on it. 1040 tax form. Dread it, run from it, it will still find you. On the other hand, if you work on your own or didn’t receive any form, then the IRS doesn’t know that you received any income. This is common for cash-based transactions. 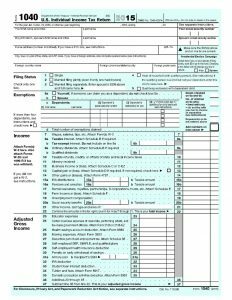 You should still pay taxes on that income when you file a 1040, but many people do not. How can the IRS catch you not reporting income? There are a few methods the IRS has of catching people who don’t report income. The IRS keeps tracks of the 1099s they get. They know how much money you received according to your 1099, and can track you down from there. Some payment processors, like credit card processors and Paypal, also report to the IRS. If a payment processor asks for your Social Security Number, they are doing so in order to report to the IRS. Some things are just suspicious. If you have unreasonably low income for a number of years, or unreasonably high expenses, the IRS might look into it. Same thing if you take a ton of unnecessary deductions. The IRS takes tips very seriously. If someone (an ex-wife or employee) claims you’re not reporting income, the IRS will look into it. What are the consequences to not reporting tutoring income? Well, if you come forward before they find out, or if they think it’s unintentional, they’ll just make you pay it back, plus penalties. You will likely get put on a payment plan, unless you somehow have the money at hand. If the IRS finds out and thinks you were trying to trick them, on the other hand, they can make you pay massive penalties or even put you in jail. This is rare, and jailtime is especially rare. This reddit post has more info. Long story short, you probably should report your tutoring income, but I’ve given you all the information you need to make your own decision about it.